I gave you a grade of F. Remember, we back our President 1000%. HIS anger is OUR anger. We are weary of your repeated obstruction of his agenda. FUND AND BUILD THE DAMN WALL! 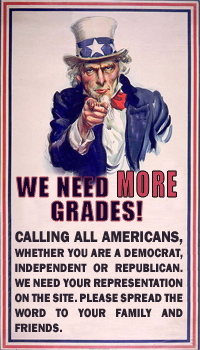 I gave you a grade of F. Remember, we back our President 1000%. We are weary of your repeated obstruction of his agenda. HIS anger is OUR anger. FUND AND BUILD THE DAMN WALL! RINO Leftists, I gave you a grade of F.
McConnell lied, McConnell and Ryan Lie About Funding the Trump Border Wall, Pelosi, Schumer declare ‘victory’ with GOP spending bill.... I gave you a grade of F.
I gave you a grade of F. Leave the 2nd Amendment alone! Grade of F. You demand Moore step down based on unproven accusations, yet you only want an investigation of Franken when proof is plentiful. Really? How about that time you raped a 13 year old girl in 1981? Wait till that comes out.